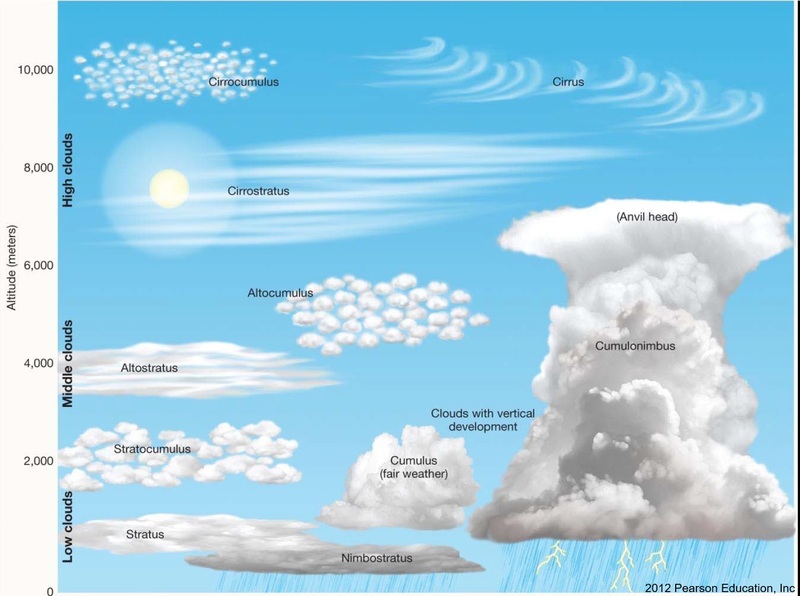 Climate4life.info - Clouds and Rain Formation. Rain is a very important climate element which affects plant growth and development especially in areas that rely on rain for crop production. This is highly varied with time and location. For example, it may rain in a particular area, while it may not rain in an area nearby. If a particular area has a certain amount of rainfall, the other area may have more rainfall. This is understandable because the rain is formed from water evaporation which condenses and becomes a cloud that always moves, depends on where the wind blows (TOT CFS' Hand note). Why does the air rise on some occasions and not on others? Why does the size and shape of clouds vary so much when the air rises? You know, we can find water in the atmosphere in 3 phases, solid, liquid and gas. Note, only water ! The basic processes how the water changing its form, evaporation and condensation. Evaporation is the changing of water from liquid to gas. By this process liquid water on earth entering the atmosphere as water vapour. Evaporation is caused by 2 factors, heat and wind force. While condensation is the opposite of the evaporation process, condensation is the changing of water from gas to liquid. Water vapour in the atmosphere condensing into liquid water droplets in a cloud (when energy is released = cooled). When the water reaches the dew point, or saturation point, it will begin to condense into water droplets that form a cloud. Dew points represent the temperature to which air would have to be cooled (with no change in air pressure or moisture content) for saturation to occur. The dew point is a good indicator of the air’s actual water vapour content. High dew point indicates high water vapour content; low dew points, low water vapor content. Addition of water vapour to the air increases the dew point; removing water vapour lowers it. Before a true cloud can form without the condensation nuclei, the water vapour is difficult to condense. it is still in a super cool liquid water form. Clouds form when the invisible water vapour in the air condenses into visible water droplets or ice crystals. The changing of water vapour into water droplets is helped by tiny particles floating around in the air - such as salt and dust - these are called aerosols. Convection is associated with surface heating of the air at the ground surface. If enough heating occurs, the mass of air becomes warmer and less dense (lighter) than the surrounding environment air, and just like a hot air balloon, it begins to rise, expand, and cool. When sufficient cooling has taken place, the saturation occurs forming clouds. This process is active in the interior of continents and near the equator forming cumulus and or cumulonimbus (thunderstorms) clouds. The rain that is associated with the development of thunderstorm clouds is delivered in large amounts over short periods of time in extremely localized areas. when moist air is forced to rise over a mountain area. As the air parcel rises it cools and condenses to form water droplets, raindrops, and eventually rainfall. Streams of air flow from different directions are forced to rise where they meet together or converge. When air is forced to converge or meet each other (such as at the center of a low-pressure system), it can only go upward (can’t go downward). An example would be the air masses flow to the center of the low-pressure area is forced to rise. This can cause cumulus cloud and showery conditions. Clouds are formed when a mass of warm air rises up over a mass of cold, dense air over large areas along fronts. A 'front' is the boundary between warm, moist air and cooler, drier air. In most cases, the two air masses have different temperature and moisture characteristics. One of the air masses is usually warm and moist, while the other is cold and dry. The leading edge of the cold and dry air mass acts as an inclined wall or front causing the moist warm air to be lifted. 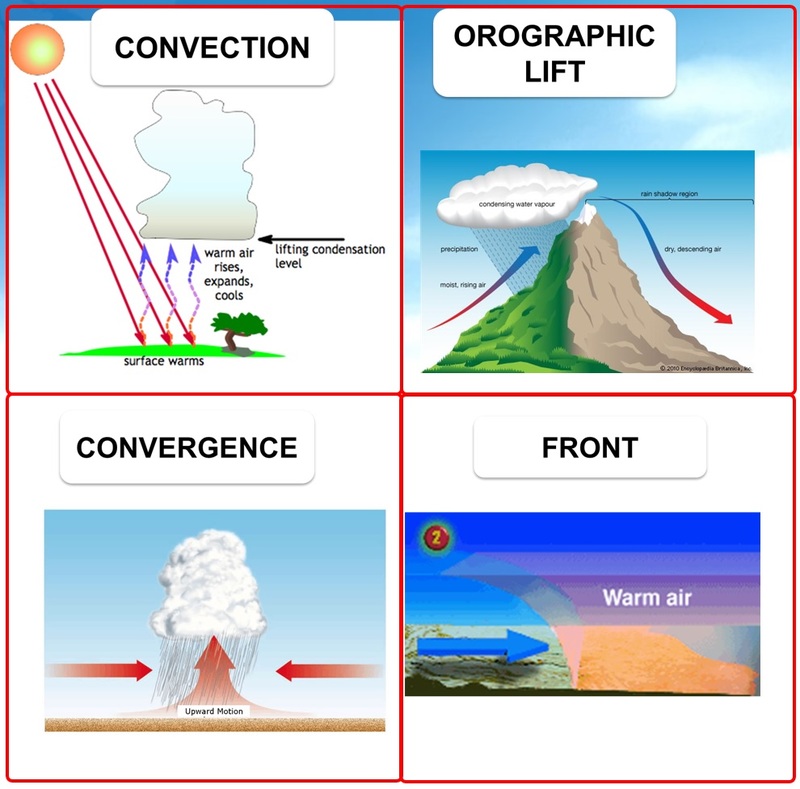 The lifting then causes the warm moist air mass to cool due to expansion resulting in saturation. Atmospheric stability is a measure of the atmosphere’s susceptibility to vertical motion. In a stable atmosphere, a lifted parcel of air will be colder (heavier) than its surrounding air. Because of this fact, the lifted parcel will tend to sink back to its original position. In an unstable atmosphere, a lifted parcel of air will be warmer (lighter) than the air surrounding it, and thus will continue to rise upward, away from its original position. Cloud are more likely to form in unstable condition. How do droplets grow and become raindrops ? It all begins with clouds. Clouds are composed of tiny water droplets from condensation on Cloud Condensation Nuclei. Initial growth is triggered by condensation, but this is limited by diffusion. They never get a chance to grow into raindrops by condensation alone – this process would take D A Y S.
The falling of any form of water from the air to Earth’s surface called as Precipitation. When will water leave a cloud and fall to the ground as precipitation? - Basically, when gravity tells it to. - When cloud droplets grow into drops heavy enough to fall to Earth, precipitation occurs. Convection currents toss the droplet high up into the cloud where it freezes. It then falls to a lower level and water condenses on it as a liquid. The tossing and freezing process repeats itself and the hailstone keeps adding layers and growing larger. 21 Responses to " Clouds and Rain Formation "
Menyusuri ilmu di blog ini, thank you! Kalau ada widget translitenya enak kali ya, seperti blog saya. Sehingga pengunjung lebih asek untuk memahaminya. Ayo pasang widget transilte seperti blog saya. Sehingga pengunjung belahan dunia bisa mengerti, dan lebih mudah pastinya. Sebenarnya menunggu ulasan likuifaksi di Palu, kalau bisa, hehehe. Terima kasih. an interesting article, after reading I know a lot about cloud and rain. Bang Day orang Pertambangan, ups maaf maksud saya berkecimpung di pertambangan atau Geologi? Water cycle looks simple; evaporation, condensation and precipitation, so the availability of clean water supplies depends on how human can preserve their environment. Memberi masukka pada Bang Day, mohon diberi teks terjemahan juga..